New York is one of the most photogenic cities in the world, there’s no doubt about that, and many images of New York might appear to you from movies, series or news programs, even if you have never been there, yet. 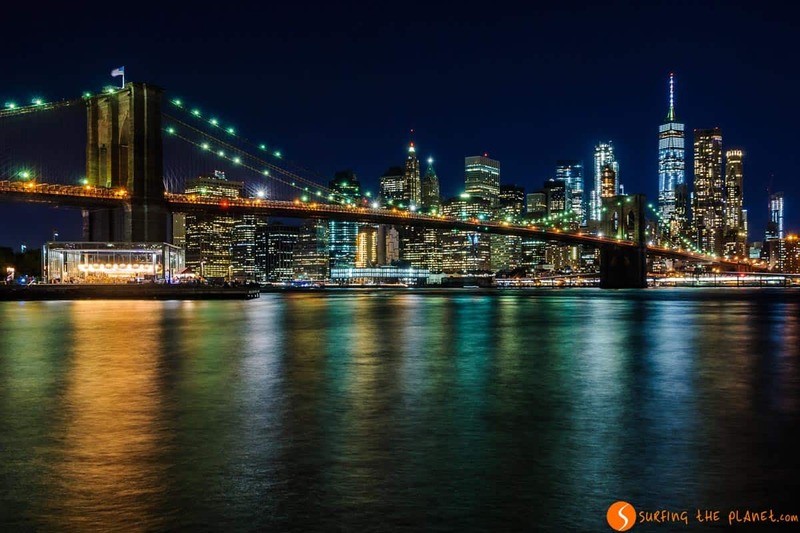 When you visit New York, you will also want to take the best pictures of the Big Apple, and the truth is you will be able to do that without making too much effort. 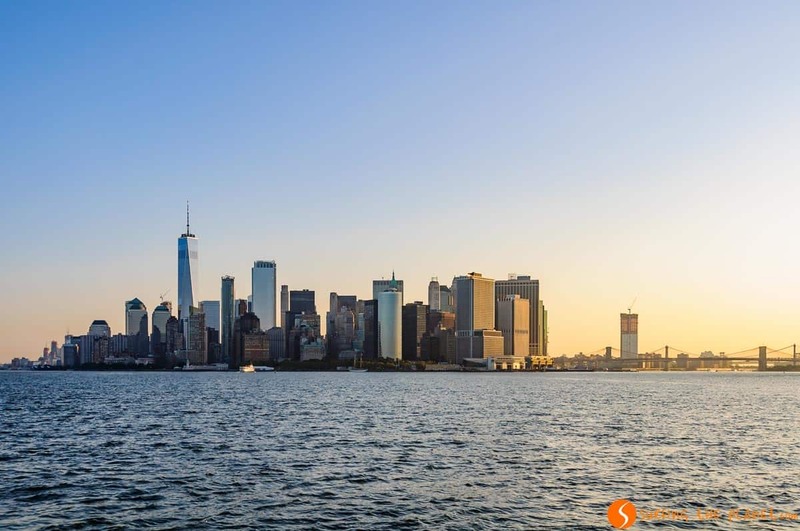 The skyline of New York is amongst the most amazing ones in the world, and we will show you the best spots to take pictures of it. 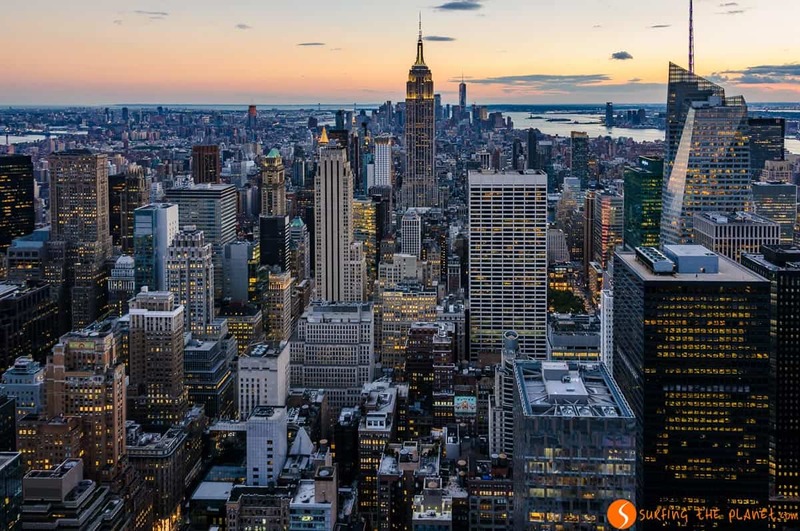 In this post we will take you to our favourite places to get the best photos of the New York City skyline. It might surprise you that a cemetery offers fascinating views of the skyline of New York. The Calvary Cemetery is one of the most antique and largest burial places in the city, where many famous people rest in peace. The most famous are probably the tombs of members of the Italian mafia buried here (Joe Masseria, for instance), and therefore it’s not so surprising that this was the filming location of Vito Corleone’s funeral in the Godfather movie. 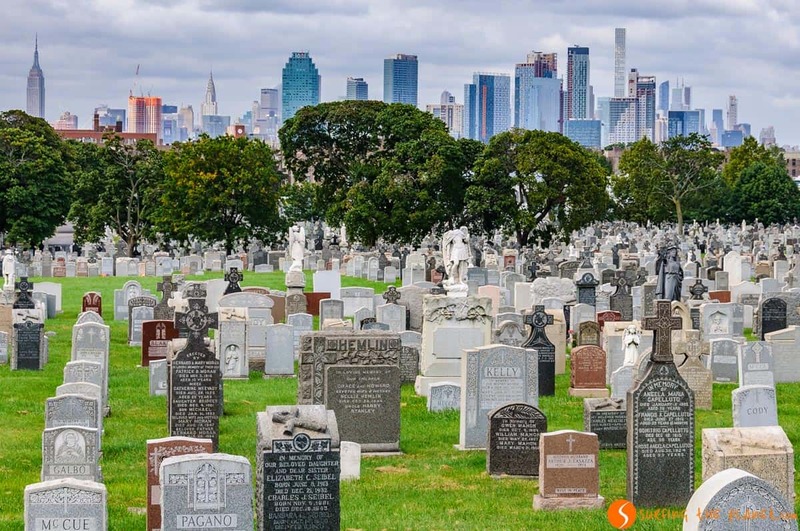 The views with tombstones in the foreground and the skyline in the background, is one of the most peculiar photos you can take in New York. For most people, the best viewpoint of New York (we share this opinion) is the Top of the Rock that offers astonishing views of the city. The viewing deck is situated in different levels (floor 67-70) of the famous Rockefeller Plaza building. 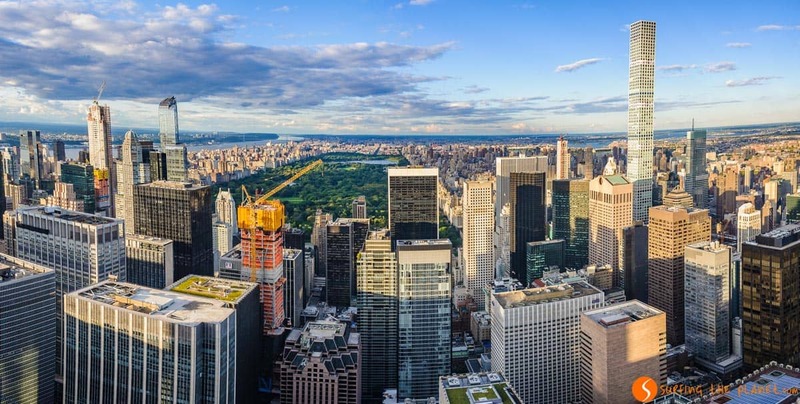 The look-out offers 360 degree views, and on one side you can contemplate the immense green of Central Park, the colors of which are especially charming at sunset. On the other side, you can enjoy possible the best view of New York with some of the most impressive skyscrapers in front of you. In the foreground you will see the Empire State Building, and in the background you can see Lower Manhattan with the One World Trade Center, the tallest building in New York City. The best part of the day to visit the viewing deck is before sunset, so you can get to see how the lights are switched on. We have visited New York several times, but it’s one of the images of New York that we want to see again every time we go back. Taking the free ferry (one of the great bargains of the city) that connects Manhattan with Staten Island lets you have a look at the New York skyline from another perspective and also to take some great photos of the city. From the ferry you get to enjoy the views of the skyline of Jersey City, Manhattan and Brooklyn at the same time. The best moment to enjoy this marvellous view is at dawn, which of course means that you have to wake up really early. Nevertheless, you will get to have in your camera some of the greatest images of New York that will be admired by your friends or whoever you show them. 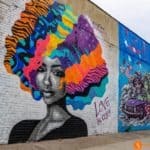 The DUMBO neighbourhood (Down Under the Manhattan Bridge Overpass) in Brooklyn is one of the most trendy places in the latter district. Intense cultural life, ample gastronomical offer makes this place very popular amongst both tourists and local youngsters. 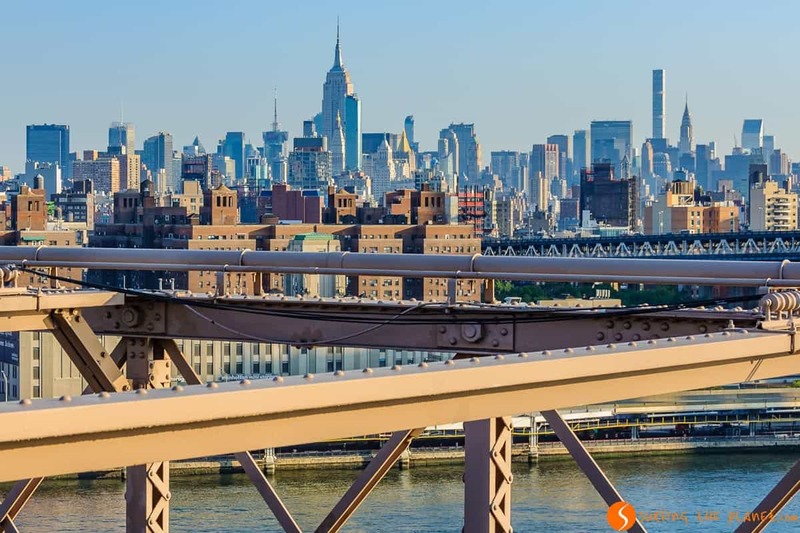 The surroundings of Manhattan Bridge also offers some of the most spectacular views of the New York skyline. These images of New York with skyscrapers and the precious Brooklyn Bridge are favourite themes of postcards. It’s worth coming back to see the view at night, since the view of the skyline from here with the lights is phenomenal. Although from the pictures taken at the viewing deck of the Empire State Building, the most emblematic building will always be missing (the Empire State Building itself, if you haven’t guessed it yet), the views from Floor 86 of this building are still astonishing. The close view of the skyscrapers of Lower Manhattan, especially at night, is probably the main highlight of the photos you can take from here. 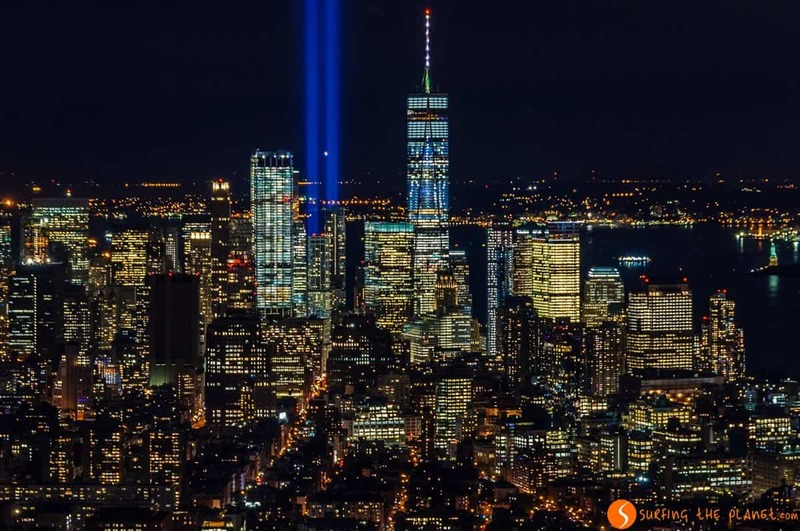 On our photo you can see a beam, which is not the result a photographic processing, but these lights are switched on September 11 every year to honor the victims of the tragic events in 2001. 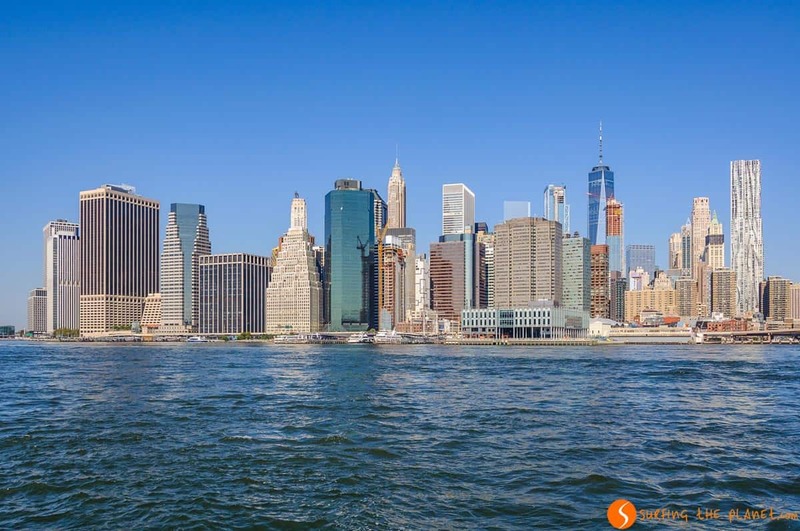 Some time ago, the best views of New York from the Brooklyn side were possible to enjoy from Brooklyn Heights, the promenade one of the chic neighbourhoods of NYC. Nevertheless, since the recent restructuring of the area the view from the Brooklyn Bridge Park has become even more amazing or at least we think so. 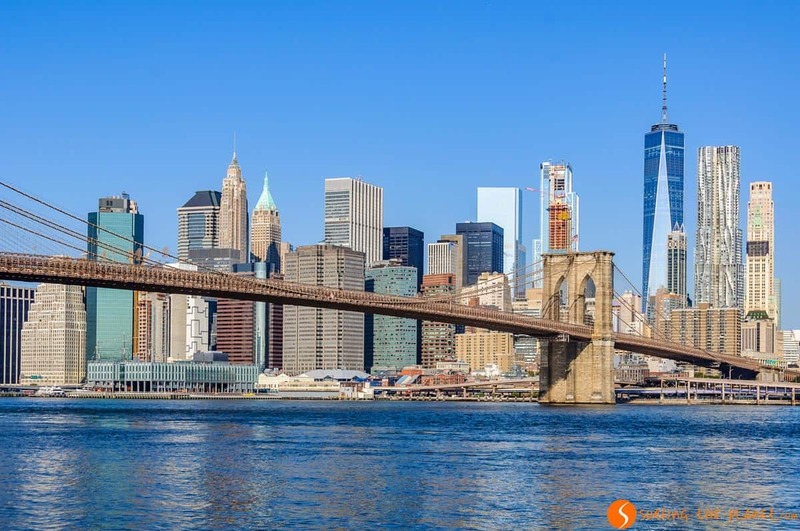 After crossing the famous Brooklyn Bridge from Manhattan, you will find this very pleasant park on the riverside with large spaces of green to have a picnic or to enjoy open-air cinema in summer. The atmosphere is unique and also the images of New York you can capture from here. 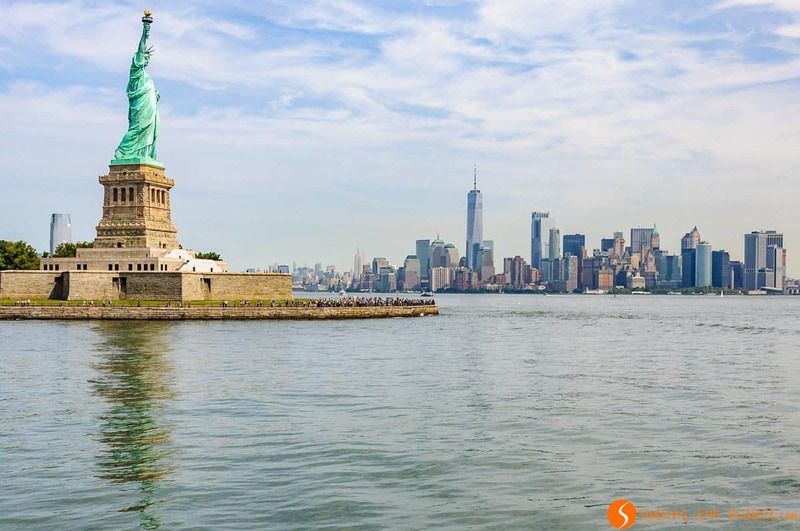 It’s not free like the Staten Island ferry, but visiting the Statue of Liberty, one of the main symbols of the US can’t be missing from any first visit to New York. In addition to visiting one of the icons of humanity, the views of the New York skyline are excellent from here. The photo you can capture from the boat with the Statue of Liberty in the foreground and the skyscrapers in the background is one of our favourite images of the New York skyline. 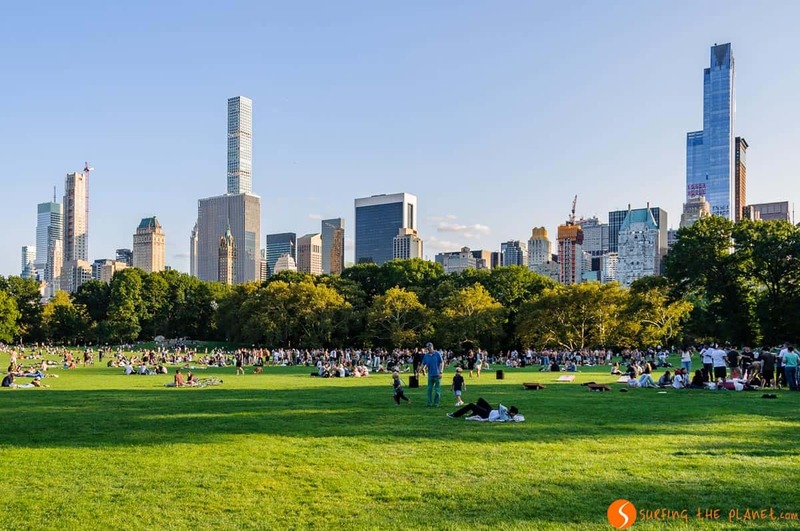 Central Park is probably one of the most fascinating urban parks in the world, and it’s our favourite place to enjoy some moments of relaxation during our travels there. On the weekends in summer the park is filled with local people who do picnic, enjoy the open-air theatre and concerts, and it’s also a great place to do sport. You might not think, but from Central Park you can also take some really great pictures of the New York skyline. Depending on the spot you pick, in the foreground you will have a nice pond or a green area full of people enjoying a day in the park. Roosevelt Island does not have any exceptionally interesting sites to visit (although you can check out the Franklin D. Roosevelt Four Freedoms Park), nevertheless, it’s worth visiting the island for the alternative views of the NYC skyline. Not only Roosevelt Island itself offers great views, but you can enjoy fascinating view from the cable car that has served as connection between Manhattan and the islands since 1976. The Brooklyn Bridge is one of the most emblematic landmarks of the city, and the truth is that one feels really special while crossing it between Manhattan and Brooklyn. In addition to being a very important highlight of history of New York City, it also offers some great views of the skyline in several directions. Therefore, while you cross the bridge, we recommend you to stop a few times to enjoy these images of New York that will be impossible to erase from your mind. It’s sure that these are not all the places to enjoy amazing views of the New York skyline. If there’s a certain place that you love, share it with us here. 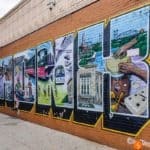 Want more tips for your visit to the Big Apple? Here’s a great plan for a 5-day trip to New York. 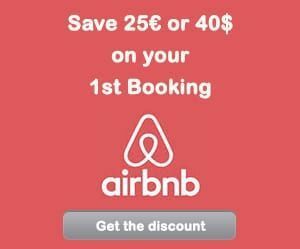 – ZZZ… BOOK YOUR HOTEL IN NEW YORK – find the best hotel for you. – FLYYY… Find the CHEAPEST FLIGHT TO NEW YORK. – BRUM BRUM… RENT A CHEAP CAR FOR A DAY TRIP FROM NEW YORK – find the best car for you.